Excellent, pre-owned, near-new condition (worn once!). Black suede. Sparkling rhinestone buckles. Aerosoles "Role Around" Black Suede Mary Jane Pump w/ 3" Heel. Previously bought and not worn, suede uppers, the rubber waffle soles present and the heels are excellent. Chadwick Brown Mary Jane Block Heels Size 9. Very minor scuffs undetectable until close inspection. Heels and bottoms are clean and in excellent condition. This is item dependent. Heel Height - 3.75". Good condition. Minimal signs of wear. Medium width. 3 inch heel approximately. Gorgeous and unique. Don't miss out. In perfect shape, worn once indoors. MIA NEW COYOTE SAND SUEDE MARY JANES. Uppers are 100% leather with the balance man made materials. Although the color is marked on the box as sand, I would consider it more of a taupe or light, muted shade of olive green. Brown smooth leather, embossed leather, and suede. Made by Farylrobin. This is a pair of patent blush Banana Republic Mary Jane women's shoes. This is a new pair of shoes but unfortunately there are some stains on some sides of the body(please see photos close). Those stains are the only problem other than that the shoes are in excellent condition never worn. If you have any question please contact me. Thank you. Don't forget to checkout my other items. Footwear outsole details: Non marking outsole. Features: Delicate ankle buckle and subtle square toe. Size: EU 40 which is about a 9 in US size. Made in Spain. Model: Blonde. Buttoned strap. Leather uppers. Black Leather. We want you to be happy with our products and we want to insure that you are. Beautiful Indigo by Clark's high heel pumps! Black in color, Leather material, Peep open toe, Zip up back, Excellent condition, Returns are accepted, Thank you for looking! Fast shipping always! Mary Jane Heels. Shoes were worn once for a couple hours. Super cute chunky heel with ankle strap. Just spring cleaning the closet. 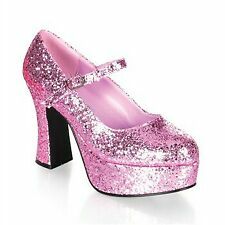 Heel height: 3.5" (8.9cm). Color: Black. • The skin of an animal shows all sorts of variations, as grains, pores, variations in thickness and colour. They are natural imperfections and not defects. Due to the quality differentiation between different monitors, the picture may not reflect the actual colour of the item. 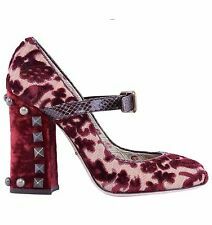 SOFFT Womens 7 M Brown Suede Patent Mary Jane Strap Pumps High Heels Shoes. Condition is Pre-owned. Shipped with USPS Priority Mail. Very good condition. Little to no blemishes. Suede and patent. Light tread wear. Please see pictures for condition details. In original box, with dust bags, never used or tried on. 3.25" wide front. Beautiful mary jane pump. stacked heels. Condition: carefully used. In excellent condition. 0.4” build-in platform. Height: 3.7” ( 3.3” actual height after deducting 0.4” platform). Size: 37 (=7B). 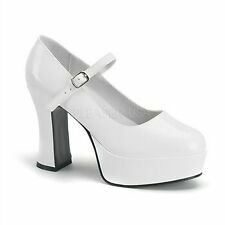 This is a classic mary jane peep toe with toe bar & ankle strap. Block heel with silver CC on heel. silver buckle. Block style heel. Women's AEROSOLES Black Faux Leather Mary Jane Heels Heeled Shoes Size 10 M EUC! Classic pair of AEROSOLES heeled mary jane style shoes in excellent condition! Black man made material / faux leather with bronze colored buckles. This sandals are coming from Macys, they are very cute but are so high for me, they are new with the own box.